Thank you for this kind invitation to present at ████████████████. 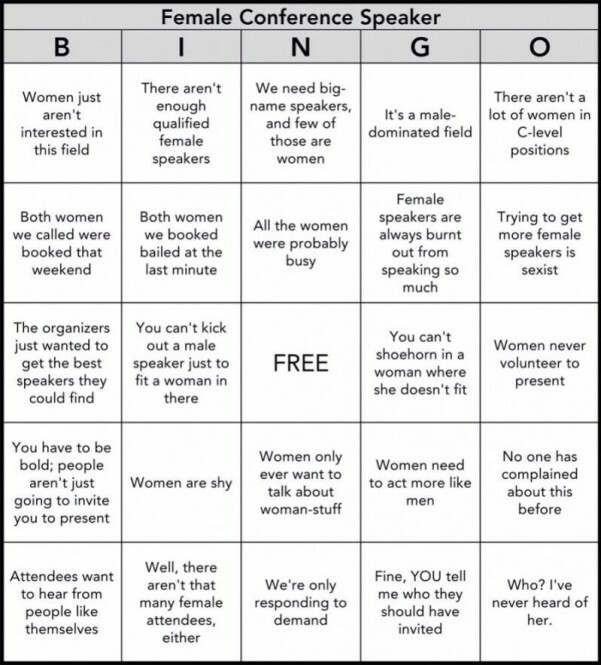 I looked at your 2013 web site, and I counted 8 women out of 60 speakers, or 13%. I regret to say that I no longer speak at events with such a poor ratio of female:male presenters. Of course it’s your business how you want to run your conference, and it is your choice about how you decide to present the world of multimedia design to your students at the University of ████████████████. But I personally don’t enjoy such events, I don’t want to endorse them, and I don’t want their endorsements. Having participated in conferences like the Eyeo Festival, I know that another way is possible in the fields of new-media art and design. I am ████████████████, lecturer at the University of ████████████████. Apart from teaching I am also coordinating the the conference ████████████████. ████████████████ is a conference about new media, art, design, development, 3d, game design, and audio/video in the city of ████████████████. This year is the ██th edition and last year we had around 2000 people attending. We have 4 tracks during 2 days. This year the event takes place on ████████████████ 2014. The audience consists of +- 40% students and 60% industry folks. As a speaker we can offer you a very warm treatment, a cool VIP dinner and a fantastic 45 min slot on our main stage with a nice audience. We will take care of travel costs and accommodation. You will see, we will do anything to make you want to come back for another edition. The one thing we can’t give is a speaking fee. ████████████████ is a free conference and we simply need our sponsor money for logistics. I would be so thrilled to have you at ████████████████! Let me know what you think and if you have questions, shoot! « Prev post: Happy New Year 2014!